1.Read to your child. In 1985, the U.S. Department of Education Commission on Reading released an extensive report on the state of literacy in the United States. One of its most significant findings concerned reading to children: "The single most important activity for building the knowledge required for eventual success in reading, is reading aloud to children.” Further research has proven that children who are read to by a family member three or more times within a week are twice as likely to achieve reading scores in the top 25% as compared to children who had not received this benefit. So go ahead – grab a book, any book, and read to your child. Youll plant the seeds for a lifetime of reading for fun and learning. 2.Be knowledgeable about your childs academic life. Know your childs teacher and get on a first name basis. Make sure you can easily get in touch with him or her (by phone, by email). Be there for open houses and parent-teacher conferences. 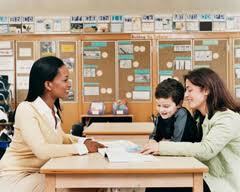 And most importantly, keep an open and ongoing conversation going with your child on classroom happenings. 3.Know your childs classmates and encourage friendships outside of school. Classroom learning works best when a solid sense of teamwork is in place. Every child needs the support of his friends, and learning is all the more fun when good friends are by your side. Because there isnt always time for children to get to know one another all that well at school, make sure that your child spends time with classmates outside of school by encouraging play dates and after school activities. 4.Attend local school council meetings and join the PTA. Get involved in the PTA. If you are a working parent and meetings are scheduled during the day, when its difficult to escape your job, suggest that meetings alternate between daytime and evenings. Your voice as a parent counts, and sometimes, its the only voice that will advocate for your child. When parents join forces, positive change can be made in our schools. 5.Take part in school life. Dont miss out on school events such as talent shows, science fair nights and seasonal potlucks. Even if your child isnt playing on the team, why not attend a school sporting event? Youll help foster an appreciation of school life. Not only will you be helping your child be successful in school, but youll also be making memories with him along the way. 6.Extend learning at home. You are your childs best teacher, and there are constantly learning moments to be made. Bake a cake with your child and teach them the basics of measurement. Have your own spelling bee night. Take a "field trip" on the weekend to an aquarium or museum. Watch an educational, family friendly movie. Bringing learning into the home and outside of school with fun and informative activities you and your child can do together is one of the best ways to support his present and future success! For tons of learning you and your child can do together - from Popcorn Science to Salty Sea Creature Paintings to Mythological Mad Libs, check out our Activities Section to find tons of great activities that will show your child the fun side of learning. 7.Show your child that you and the entire family value education. Each and every parent can find a way to show their child that learning is a lifelong adventure. Read a book. Take a class that interests you. Share with your child the learning experiences that you have had on the job. Bond with your child over educational books, movies and media. Show your child that learning can be enjoyable and doesnt end once school is over and done with. Your child and your childs teacher will appreciate your help and support as an invaluable part of your childs road to lifelong success in and out of school.